VW's Tanneberger speaks at the CES in Las Vegas. 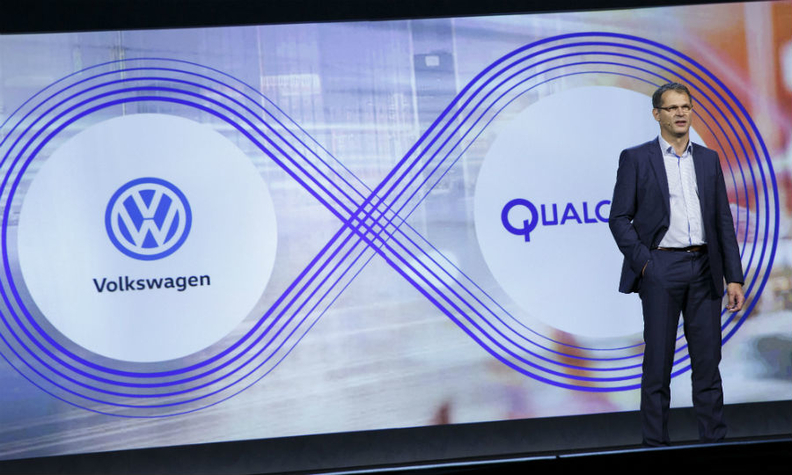 LAS VEGAS -- Volkswagen will offer the first embedded application of Amazon's Alexa voice service in a vehicle, as the growing focus on network-connected appliances and other home devices inspires collaborations between automakers and technical service providers. While other automakers including Ford, BMW and Hyundai are introducing Alexa, their applications work only via a smartphone app connected to the car's infotainment system. VW says it is the first to have directly integrated the feature into the car's own system without an intermediary as interface. Thanks to the new feature, drivers will be able to instruct their connected smart home to do things such as turn on the heating while on a long ride back just in time to arrive to a comfortable temperature. VW showed a Tiguan SUV at this month's Consumer Electronics Show here with a voice command system that reacts to the keywords such as 'Hey Volkswagen.'" "We have several that we programmed that customers can choose from," said Volkmar Tanneberger, VW’s head of electronics development. "So you can say for example 'Hey Buddy, ask Alexa how warm is it at home?' and then it channels the command through to Alexa and Alexa reports back that it's 20 degrees." The system uses next-generation voice recognition software. Through artificial intelligence, VW said the system becomes increasingly familiar with a user and his or her preferences over time, and utilizes this knowledge for personalized route suggestions. "Volkswagen and Amazon share a common vision around voice as the future, it's a safe and natural way for us to interact with the vehicle," John Scumniotales, general manager for Amazon Alexa Automotive, said.